In this article we look at the recent changes to the US Sunshine Act and ask Mark Linver, Managing Director at Huron Life Sciences, to give BMI SYSTEM his insight into the hurdles pharmaceutical companies must overcome to ensure compliancy. The Physician Payment Sunshine Act details how healthcare manufacturers (pharmaceutical, biotechnology and medical device companies) must disclose financial relationships with doctors and teaching hospitals in the US. Renamed the National Physician Payment Transparency Program (Open Payments) – its final changes took place in February 2013 and declared that from August 2013, all payments should be recorded and presented to the Government’s Centers for Medicare and Medicaid Services (CMS) by the 31st of March 2014. A 45-day review and correction period will then follow this date; during which recipients, doctors and investigators may sign into the CMS secure website and review the data submitted by healthcare manufacturers and choose to dispute certain payments or other transfers of value. Following the end of this review period, healthcare manufacturers will have an additional 15 days to correct data following a dispute and resubmit to the CMS. In September 2014, the information will then be published on a publicly available website. The challenges of local to global compliance also need to be considered by healthcare manufacturers: a topic discussed by BMI SYSTEM at the CBI 11th Pharmaceutical Compliance Congress, Washington, DC. Since all US businesses working in different countries should to be compliant with local laws, BMI SYSTEM’s presentation will investigate: The dynamic shift from implementing disparate country by country compliance solutions to a single Global 2 Local (G2L) approach. 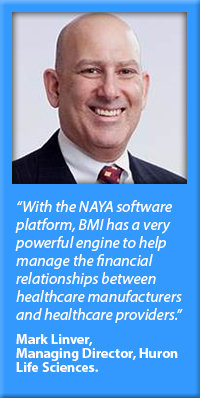 Changes in the relationships between healthcare manufacturers and HCPs are already being observed in the US. For example, some hospitals do not want to see doctors’ names in print and are discouraging payments from HCPs. It will therefore be interesting to see how the public will react to the publication of payment data in September 2014, and how this will drive further changes. It will also be interesting to see how relationships will alter in Europe, in the light of modifications to the European Federation of Pharmaceutical Industries and Associations (EFPIA) disclosure code. The recent news that GlaxoSmithKline (GSK) will stop certain payments to doctors, for attending conferences for example, indicates that relationships are also changing this side of the Atlantic.